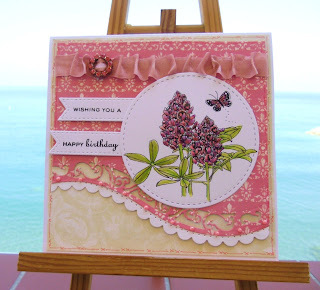 Beautiful card Sylvie,I like the floral image and the lovely design. Pretty image and pretty design! I love that curved edge border. This is gorgeous Sylvie. The flowers and colours look so pretty. Such a pretty card! thanks for playing with us at Seize the Birthday! Sylvie this is such a pretty card. Just love everything about it. beautiful card Sylvie, glad you enjoyed your trip. beautiful :) Thanks for joining us on Seize the Birthday. It has been a little cooler in the UK today .. .. we actually managed a bit of gardening!! Shock horror!!! Pleased your daughter is settled and happy. Loving your card. Lots of lovely goodies and a fabby colour combo. Hope all is good with you and that you have had a nice weekend. Hi Sylvie,love that curved border it works so well with the rest of the layout. The digi is so pretty. Glad you had a sunny trip to the UK! Excellent, Sylvie! Congratulations! Good Luck!